I have a seven or eight recordings of this, the most approachable of Mahler's symphonies and had no reason to suppose that this one could or would supplant any of them in my loyalties. In fact, I have played this recording more than half a dozen times since receiving it and have on each occasion increasingly marvelled at the sheer rightness of Jurowski's judgment regarding colouring, dynamics, texture and tempo. This is an extraordinarily sensitive and nuanced account which eschews the temptation to stick to the sunny-side and run blithely through the score. There are frequent, telling adjustments in the phrasing which never sound fussy or applied. Thus we hear a lovely swing in the klezmer music, echt Viennese Schwung in the waltz section of the third movement, splendid, reckless galumphing in the peasant dances and a really eerie atmosphere to the Bruder Jakob interlude. Another reason for hearing this lies not just in the quality of the playing but also in the inclusion of the Blumine movement, which Mahler had discarded as redundant by the time of the symphony's fourth performance in Berlin in 1896. Jurowski justifies its reinstatement here by virtue of the sly tension and dynamism he maintains throughout, successfully undercutting any tendency towards sentimentality. It opens with a yearning, melancholy riff for trumpet seemingly lifted from Donizetti's Don Pasquale, an archetypically Romantic theme underpinned by comforting pizzicato chords from the lower strings. The opening of the symphony is very relaxed and leisurely, the orchestral textures wonderfully clear and detailed without sacrificing homogeneity. The distant horn-calls are as numinous as you could wish, then Jurowski builds inexorably to a terrific climax at 14:08, complete with fortissimo trumpets and whooping brass in a blazing tutti. The closing movement is correspondingly thrilling, with Jurowski giving his players full rein for the first tempestuous three minutes. He is alive to all the moods in this music and doesn't make the mistake of treating it as just a bucolic romp. The sound is first class, especially so given that this was recorded live in the Royal Festival Hall. The perspective on the instruments is close but there is still sufficient reverb around them and we are miraculously free of audience intrusion. The violins are arranged antiphonally to provide more breadth. 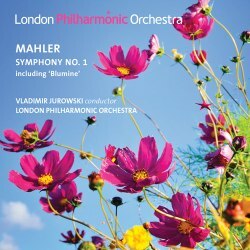 I look forward to more of Jurowski's Mahler with the LPO; this recording is a triumph.